PEARL, MS -- In conjunction with the The ALS Association Louisiana-Mississippi Chapter, the Mississippi Braves baseball team is proud to announce its commitment as presenting sponsor of the 2014 Jackson Walk to Defeat ALS. Trustmark Park will host the annual event Saturday, September 27. ALS, also known as Lou Gehrig's Disease, progressively paralyzes its victims, attacking nerve cells and pathways in the brain or spinal cord. ALS has no known cause or cure, but the community is rallying together to help change that. The ALS Association is a perfect fit for the Mississippi Braves. M-Braves General Manager Steve DeSalvo has agreed to serve as Chairman of the Walk to Defeat ALS. Trustmark Park will also host other events over the weekend to raise more money and awareness for ALS. "Minor League Baseball is a major supporter of The ALS Association because of baseball's connection to Lou Gehrig," DeSalvo said. "This year marks the 75th anniversary of Lou Gehrig's farewell speech. We've gotten behind the efforts of the Louisiana-Mississippi Chapter and plan to put on a lot of various events at Trustmark Park so we can help them not only find a cure but also a treatment for this fatal disease." Kelly Viator, Executive Director of The ALS Association Louisiana-Mississippi Chapter, is excited to have the Braves on board. "We're very grateful for the Mississippi Braves' support of our signature event, the Walk to Defeat ALS," Viator stated. "This event builds awareness of ALS, raises funds to support patient services and research for treatment and a cure, and brings the community together for an important cause," she said. "As the presenting sponsor and host for the walk, the Braves will have a significant impact on families living with ALS in the Jackson area. We're looking forward to a successful partnership." In addition to hosting the Walk to Defeat ALS, the Braves will host A Night with The ALS Association on Thursday, July 10 in the Farm Bureau Grill at Trustmark Park. Guests will enjoy light refreshments and learn more about the work that The ALS Association Louisiana-Mississippi Chapter is doing in the Jackson area and how community business leaders can become involved as corporate supporters. "I was fortunate enough to accompany a group of pALS (persons living with ALS), caregivers, Chapter staff and friends on a trip to Washington D.C. in May to tell their story to the Mississippi legislature," DeSalvo explained. "This has had a huge impact on me, and I want to ask the Jackson-Metro Area to help 'Strike out ALS'." For more information or to attend A Night with The ALS Association, contact Chelsea Moreau at 225-343-9880, ext. 6 or chelsea.moreau@alsalams.org. Persons with ALS (pALS) will gather with their families and friends at The Walk to Defeat ALS, hoping their steps will make a difference for ALS patients living in Jackson. Many who walk have a loved one who is still fighting the deadly disease. Others walk in memory of a loved one. Some walk out of a simple concern for those who are suffering with Lou Gehrig's Disease. With a life expectancy of only two to five years, patients have an urgent need, and the community is stepping in to fill it by walking for those who can't. 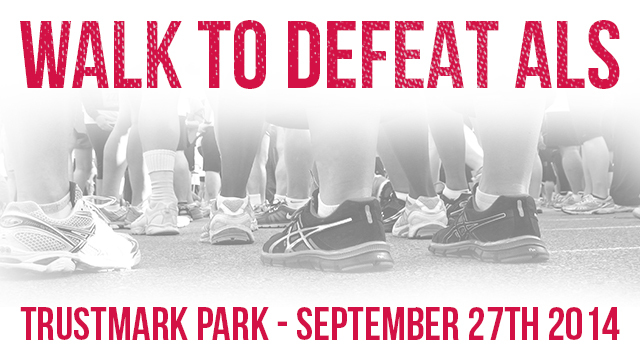 The Walk to Defeat ALS is The ALS Association's signature event in which all funds directly support cutting-edge research, programs and patient care. Last year's events in Louisiana and Mississippi raised $535,000. The ALS Association Louisiana-Mississippi Chapter holds six walks throughout the two states annually. The chapter aims to raise $600,000 this year to continue ALS research and to extend local patient services programs. The Mississippi Braves baseball team is the first presenting level sponsor in the history of the Jackson walk. All interested walkers should call 800-891-3746, or register online at http://web.alsa.org/Jackson2014. The ALS Association Louisiana-Mississippi Chapter was founded in April 2005 to serve the needs of those living with Amyotrophic Lateral Sclerosis and their caregivers. The ALS Association is the only national not-for-profit health organization dedicated solely to the fight against ALS. The Louisiana-Mississippi Chapter works with The ALS Association's National Office to accomplish a shared mission. Our chapter focuses primarily on helping local patients and families living with ALS while the National Office focuses primarily on research and national advocacy. The Chapter supports the National Office through revenue sharing and research contributions. The National Office supports the Chapters by providing up-to-date information and materials. For more information about The ALS Association Louisiana-Mississippi Chapter, go to www.ALSALAMS.org.